Football - Brighouse Town v Goole. Aaron Martin for Brighouse. Brighouse Town manager Vill Powell’s policy of tying down his key players on contracts well ahead of next season is already paying off. In the past few days Manchester club Droylsden have made a move for the Evo-Stk NPL club’s leading scorer last season, Aaron Martin, but were sent packing. “Once they knew he was under contract that was it,” said Powell. “Obviously they were impressed with the hat-trick he scored against them in the last game of the season, plus his near misses and general overall play. Powell has announced his management team line up. Assisting him will be Leon Wainman and Stacy Reed and there is promotion for Simon Ward, who will combine being first team coach with his under 21s’ manager’s job. Harry Gee continues as physiotherapist, chief scout is Mark Booth, a former Town player and assistant to Paul Quinn, and last season’s assistant manager Nat Brown will be highly involved with player recruitment. Town have revealed details of their four club tournament on Friday and Saturday July 20-21. On the Friday evening Town will play Hemel Hempstead while Liversedge will entertain Huddersfield Town Under-23s. The following day, Friday’s losers will play at noon with the clash of Friday’s winners to follow at 3pm. Games will be of three 30 minute periods and will be decided by penalties if the scores are level after the 90 minutes. There will be roll on roll off substitutions. Town will also entertain Buxton from the Evi-Stik Northern Premier Division on Tuesday, July 24 (7.45) and Barnsley club Shaw Lane will visit for the annual Dan Wilkinson Memorial game for his trust set up by his parents on Thursday, August 9. Huddersfield Town have offered third year scholarships to centre back Oran Thompson, 18, who came to Brighouse on work experience last term, and midfielder Isaac Marriott, 18, who also joined Powell’s squad. 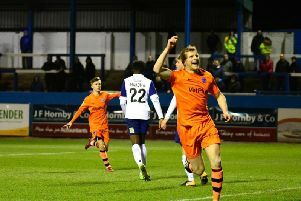 It is understood the arrangement stays in place for at least two players next term and Town fans will be hoping they acquire Marriott as he was outstanding. Town hosted the West Riding County Amateur League final last Friday night. Steeton with former Town player Elliot Scott in their side came out victors 4-1 over Route One Rovers.